Did you know that you can create Work Orders (Rework Orders) to capture the proper cost, and to eliminate self-referencing violations? 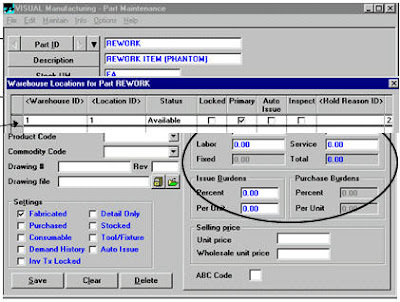 The procedure for creating Work Orders assumes that the item to be reworked has been received into inventory. It will allow an item’s cost to be issued to WIP, and any additional rework cost applied to the item when received back into inventory. It is understood that a phantom item will have to be created and periodic inventory adjustments made to zero the inventory balance. This phantom item will have no cost impact on inventory. You might want to create a unique Job ID to identify the Rework Orders. Enter the Lot ID, Want Date and Quantity to be reworked. Enter 100% into this field and tab. The system will fill in the Labor, Bur, Serv percents automatically. This action tells the system to apply all cost to this item. Tab to the Desired Qty field. Enter the Quantity that will be reworked. Now you can add the material to be Reworked to the Work Order. 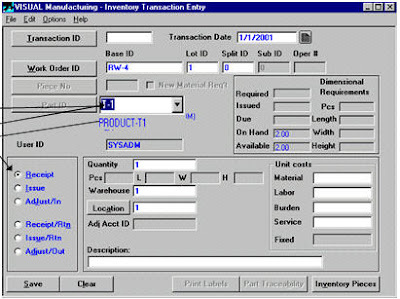 This will enable you to issue the item and all associated cost from inventory to WIP. You can now issue the item to be reworked to the Work Order. You can now receive the Work Order into inventory. You will now have to do another receipt for the CO-Product. Select the pull down arrow. Select the CO-Product and finish the receipt. This transaction will bring all cost incurred into inventory against the CO-Product. When Costing Utilities is run, the inventory value for Reworked item will be revalued. This VISUAL Did You Know tip was brought to you by BizTech VISUAL Consultant Joe Horvath. WILL THE RE-WORK COSTING BE FILTERED TO THE TOP-LEVEL ASSEMBLY? The answer is Yes. If you issue the original part to the rework work order, the original cost plus the rework costs will be accumulated into the cost layer of the finished part after receiving it back into inventory from the rework work order.